Now that it’s fall, it’s time for soups and stews, and a nice savory bread to go with them. I love bread, and I love making bread, but I don’t always have the time for the kneading, rising, punching down, and forming process that is generally required for a yeast bread. Okay, it’s a whole lot easier these days with a sturdy mixer with a dough hook, but it still takes time. 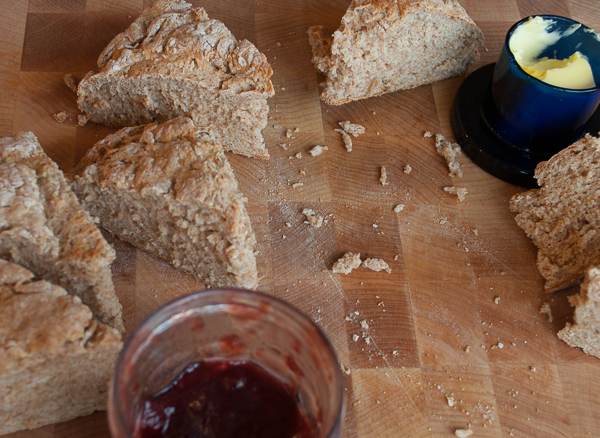 This soda bread is quick and easy to prepare, and it goes just as well with a hearty chowder as it does with butter and jam with afternoon tea. 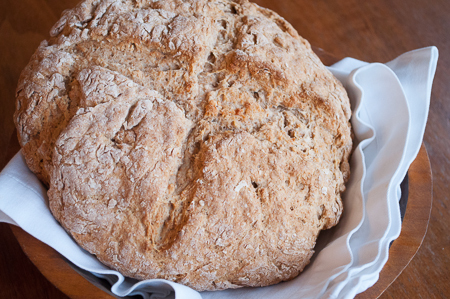 As a child, my only experience with soda bread was when my mom made it on Saint Patrick’s Day. We thought it was pretty cool, probably because we only had it once a year and it had raisins in it. I’ve made several versions of that bread over the years including my mom’s recipe. This bread is considerably more rustic than those other versions. It’s the bread that Irish and Scottish mothers and grandmothers have been making everyday for hundreds of years. Last night we went to the Maryland Renaissance festival, specifically to attend a concert by this band. It was dusk, the wind was whispering through the trees, a light drizzle was falling, and the haunting bagpipe music filled the air. For just a short time I was transported to a world far away where work and daily life were far simpler than today. I think this bread would be part of that imaginary life. Soda bread is best eaten the day it is baked. If that’s not possible, you can freeze the remainder, thawing it out the same day you intend to serve it. 1. Preheat the oven to 450 degrees F. Whisk the flours, salt, and baking soda in a large bowl. 2. Make a well in the center of the flour mixture and pour in 1.5 cups buttermilk. Stir the buttermilk into the flour working from the center to the outside of the bowl. Add more buttermilk if needed. 3. Place the dough on a lightly floured surface, flour your hands and shape the dough into a neat ball, tucking the edges underneath the dough ball to smooth it. Do not knead the dough as this will develop gluten and toughen the dough. Use your hands to flatten the dough ball into a disc about 1.5 inches thick. Transfer the dough to a baking sheet. 4. Cut a cross or “X” into the top of the dough, then use a knife to prick the center of each of the four sections. Cutting the dough in this way allows more heat to enter the center of the bread, resulting in more even baking. 5. Bake the bread for 15 minutes then reduce the heat to 400 degrees F. and continue baking for another 20-25 minutes. The bread should be golden brown and sound hollow when tapped. Remove from the pan and cool the bread on a wire rack. Allow to cool before cutting into wedges to serve.